These large Mid-Century Mod Retro Patterns 7" Designer Letters bring a retro-inspired charm to bulletin boards. 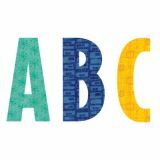 This package features 110 pieces, including uppercase letters, punctuation marks, and symbols. The classic color palette of these punch-out letters makes them versatile for use on any bulletin board or display in a school, office, college dorm, senior living residence, church or daycare center. This Mid-Century Mod Calendar Set Bulletin Board features retro-inspired patterns and colors for a modern vintage style. Atomic starbursts, boomerangs, and geometric shapes are just a few of the fun Mid-Century design elements you'll find in this set. This 67-piece calendar set includes a calendar chart, 12 month headlines, 31 pre-numbered calendar days, and 4 blank calendar days. The set also includes a days-of-the-week chart, a seasons and weather chart, and coordinating labels. The bright colors and retro-inspired design make this set perfect for children and adults of all ages. Who can resist these yummy-looking donuts! This Mid-Century Mod Donuts Border will add an accent of deliciousness to any bulletin board. 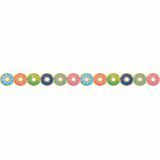 The fun die-cut and retro-inspired color palette gives these donuts a playful look that is sure to delight students and adults alike. 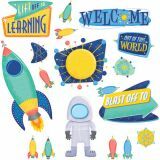 This fun design can be used in a variety of ways at school, in the office, on a college campus, and more. Add some sweetness to your classroom birthday display with this Mid-Century Mod Happy Birthday Mini Bulletin Board. The fun, retro-inspired color palette gives these donuts a playful look that is sure to delight students on their special day. 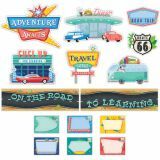 This Mid-Century Mod On the Road to Learning Mini Bulletin Board is a terrific way to decorate for learning adventures. Use the vintage-looking postcards included in this set to have students write about a favorite memory from summer break. This is a great activity for the first week of school. Or create a timecapsule and have students write a postcard to themselves that they will read at the end of their learning adventure (school year). This set can also be used for summer camp, church camp, or other learning programs. This Mid-Century Mod Retro Rewards Border features iconic shapes, patterns, colors, and positive words (Groovy! Fab! Wow! Neato! Hip! Cool!) to encourage students in vintage-inspired style. 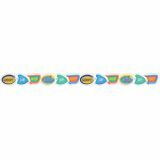 This colorful border will brighten any classroom bulletin board or display! Especially great for those highlighting student work. 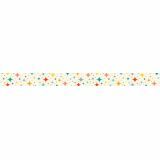 For modern style with retro flair, use this Mid-Century Mod Retro Stars Border on your bulletin board. The subtle cream background is complemented by the iconic atomic starburst designs in a rainbow of classic mid-century mod colors including teal, yellow gold, aqua, tangerine orange, classic red, coral, navy, and gray.